Remember the great wine tasting I went to in the autumn? Yesterday it was time for another one. Hosted at The Avenue Cookery School, Angie Steele prepared all the amazing food and Andrew Corben-Clarke from The Burgundy Portfolio talked us through the wines, mixing amusing anecdotes with facts. 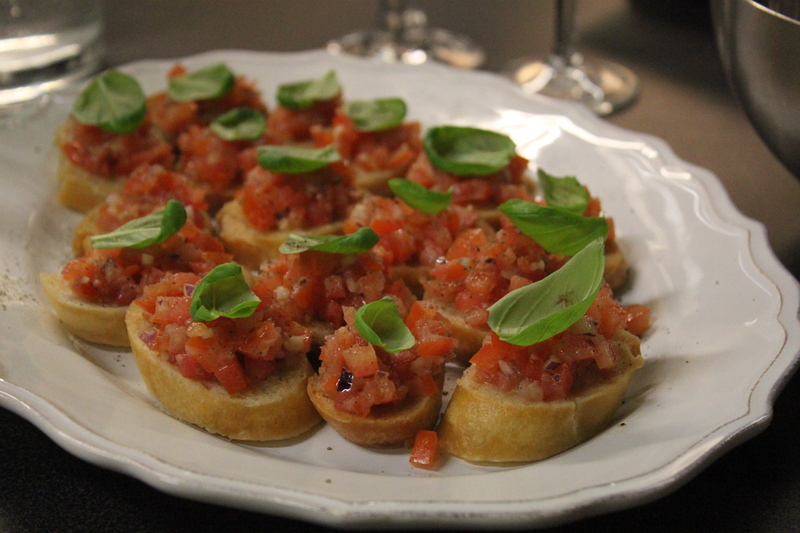 We started off with a dry (Fino) sherry (Manzanilla “La Gitana”, Bodegas Hidalgo) and a classic bruschetta. 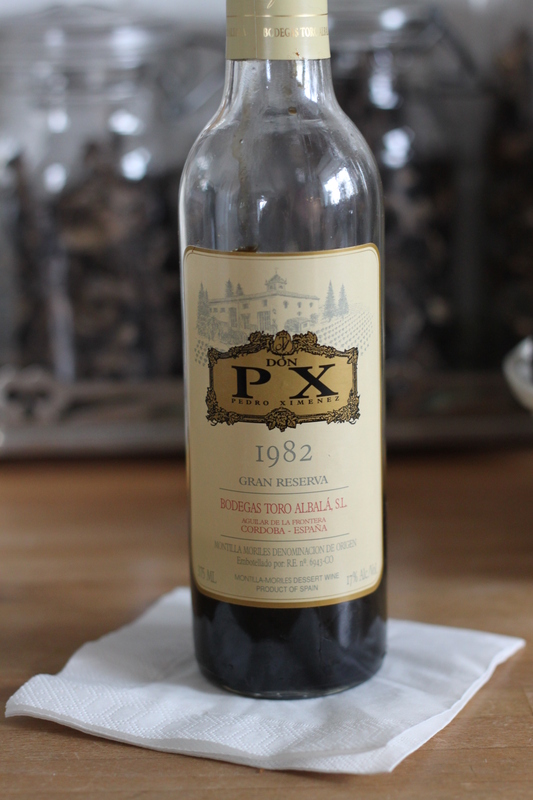 I am not really a sherry drinker and although I thought this one was very nice with the bruschetta, I probably wouldn’t enjoy it without any nibbles. Next up was a wonderful 2010 Rully (David Moret) that was definitely more my thing. 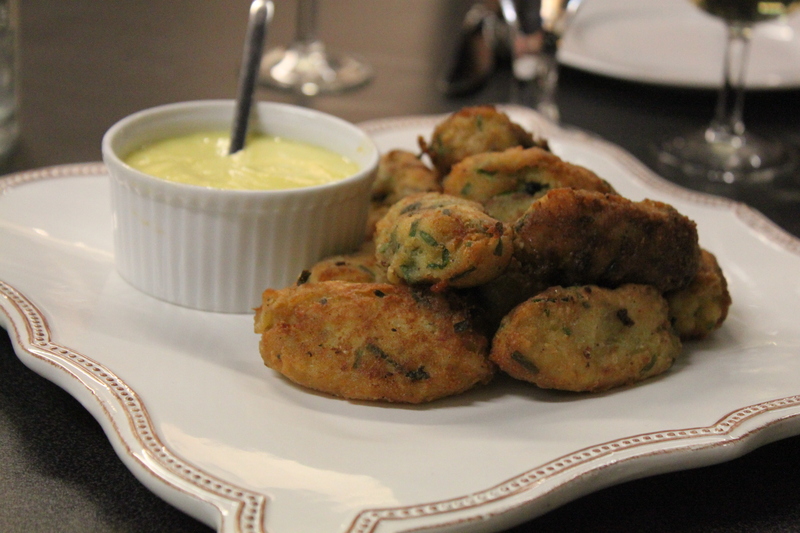 And served with fluffy yet crispy salt cod fritters with a saffron aioli, it was a match made in heaven. To me the wine tasted both buttery (yum) and fresh at the same time. 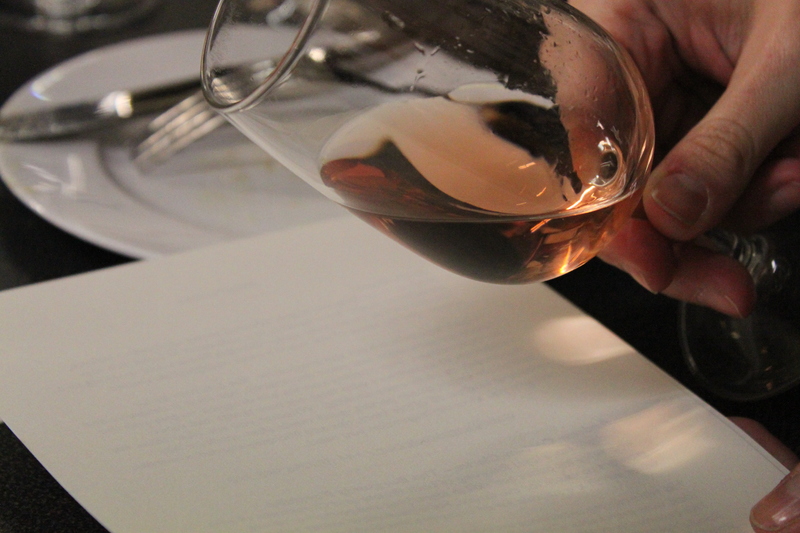 We also tried a rosé, 2011 Beaujolais Rosé Dom. 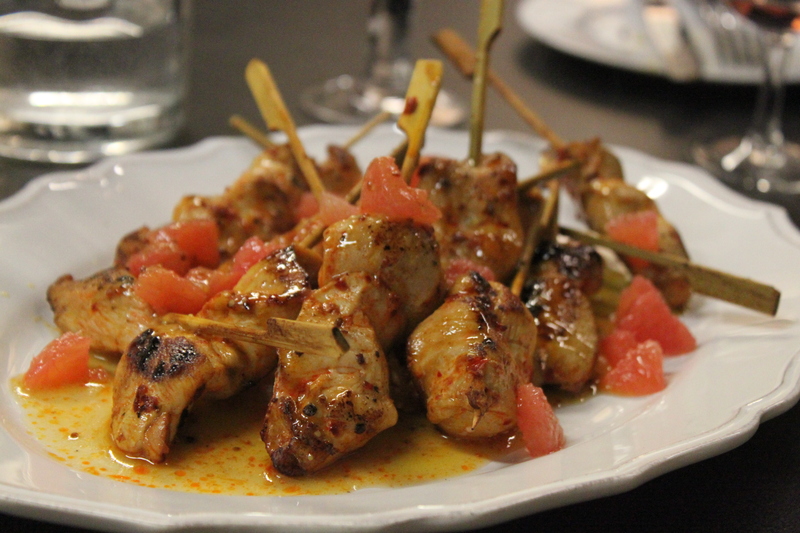 de Sermezy, with harissa marinated chicken scewers with grapefruit segments and a citrus dressing. 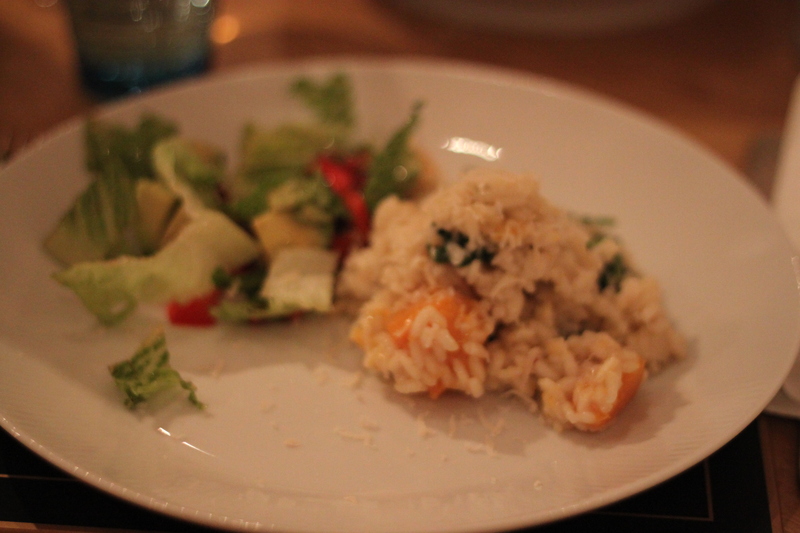 The wine was a mouthful of summer and the fruitiness complimented the citrus flavours of the dish. We then moved on to the reds. Firstly, a light 2009 Moulin-à-Vent (Dom. 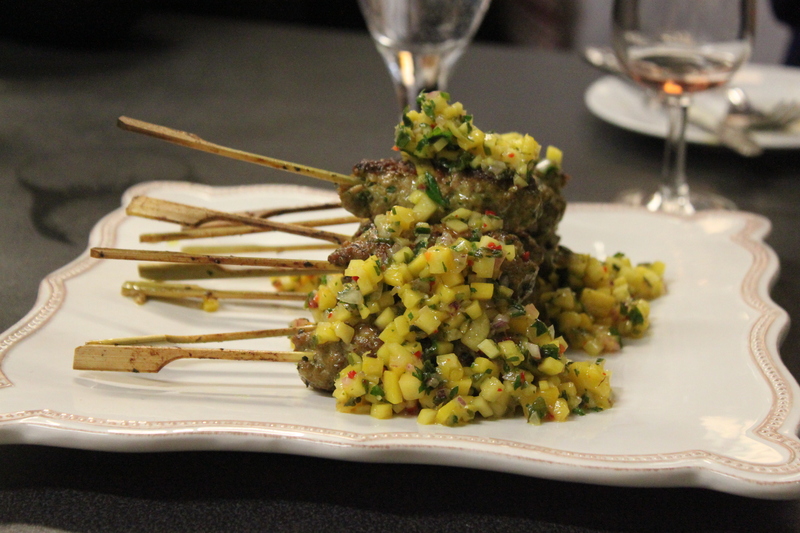 Benoît Trichard) and Thai pork and lemongrass scewers with mango salsa. 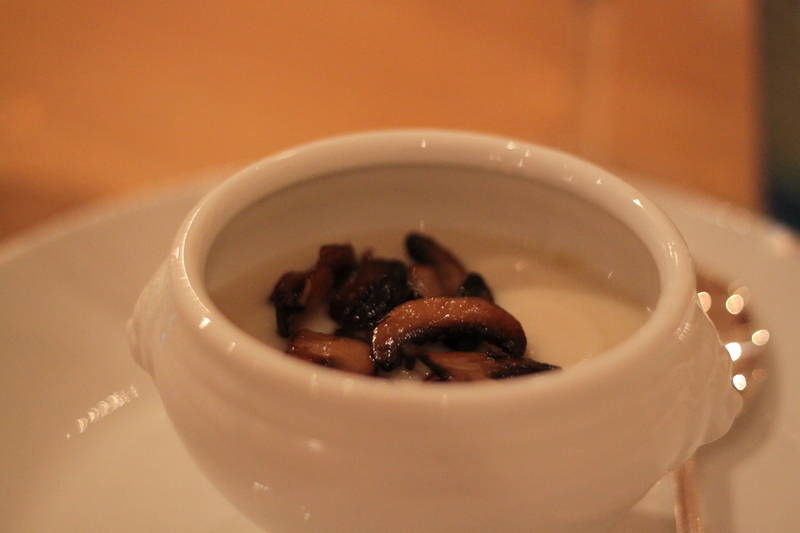 The scewers were spicy and moorish, and although the wine was light I thought it held up the fiery food well. 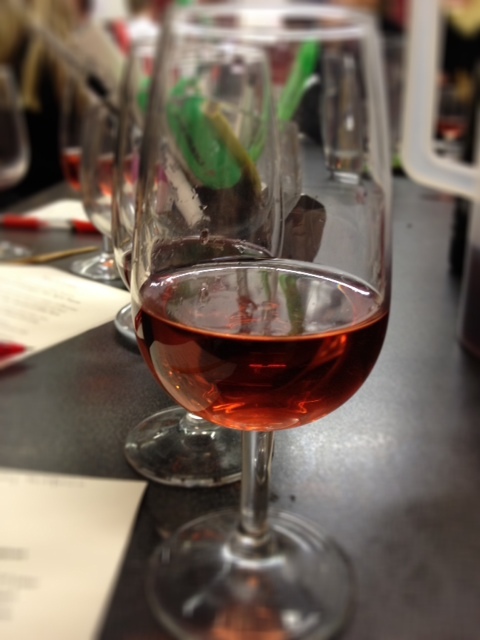 The next red was a real heavy-weight in comparison with the first one and bursting of flavour. 2008 “Star Terre”, Syrah, Oroncio worked really well with the puy lentil galettes with cumin and coriander. Andrew told us that it was the earthiness of the lentils (and the cumin) that really worked with this heavier wine, just like it would work with game or mushrooms. 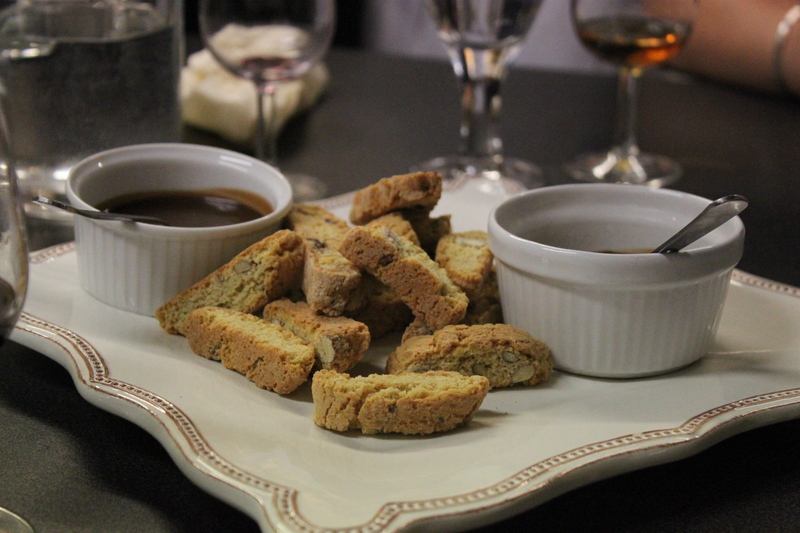 The tasting finished with something sweet; crunchy biscotti with a chocolate dipping sauce (oh yes!) and a wonderful Sauternes,1999 Ch. Doisy-Vedrines, 2eme Cru Classé. It was golden and utterly delicious and the perfect ending to the evening. These type of wine tastings, with food, are definitely something I prefer to a stuffy all-wine tasting. Pairing the right food with the right wine is definitely a skill and just adds a whole different dimension to a meal. I already look forward to the next one! Last Wednesday I went with my friend Emily to a wine tasting organised by one of her mother’s colleagues at The Avenue Cookery School. This was their first wine tasting, organised by Angie from the cookery school and Andrew from the Burgundy Portfolio, and Emily had helped spread the word. What was so interesting with this particular wine tasting was the fact that the wines were paired with canapés perfect for each particular wine. 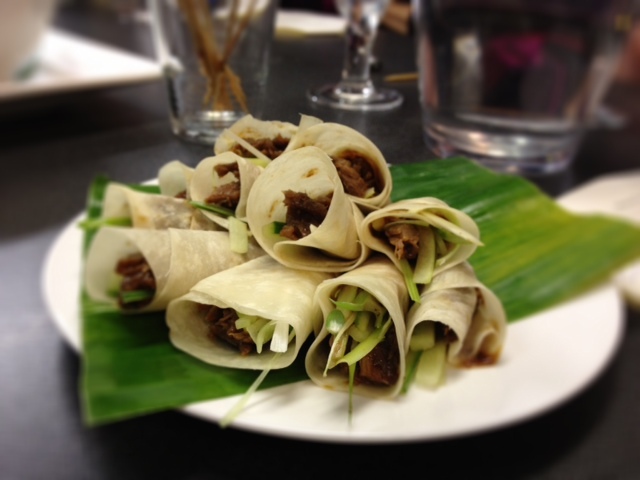 It was so exciting to first taste the wines on their own and then with the food. Unfortunately I only started taking photos half way through the tasting, as I was to embarrassed to leave my seat and interrupt to run out and get my phone from my bag in the room next door, but I got over it as you can see. Once we arrived for the wine tasting we each got some sparkling wine to sip on while waiting for the others. It was a Crémant de Bourgogne (Dom. Agnès Pacuet) which I thoroughly enjoyed and even had several top-ups of. The two large tables were filled with goodies we expected was for later, but it was there for us to eat while we were mingling. So we helped ourselves to olives, crostini with Stilton, caramelized red onions and figs, charcuterie boards, and filled focaccia. All delicious! When everyone had arrived we sat down and let Andew entertain us with stories and facts about the wines as he presented them. The first wine we tried, 2011 Petit Chablis, Dom. Nathalie & Gilles Fèvre was a light and fresh white what worked really well with both canapés it was served with. My absolute favourite was the brioche crouton with soft ash goat’s cheese and truffled pear, but the red pepper tarte tatin with tapenade and basil was gorgeous too. Next up was another white; 2009 Bourgogne Blanc, Dom. 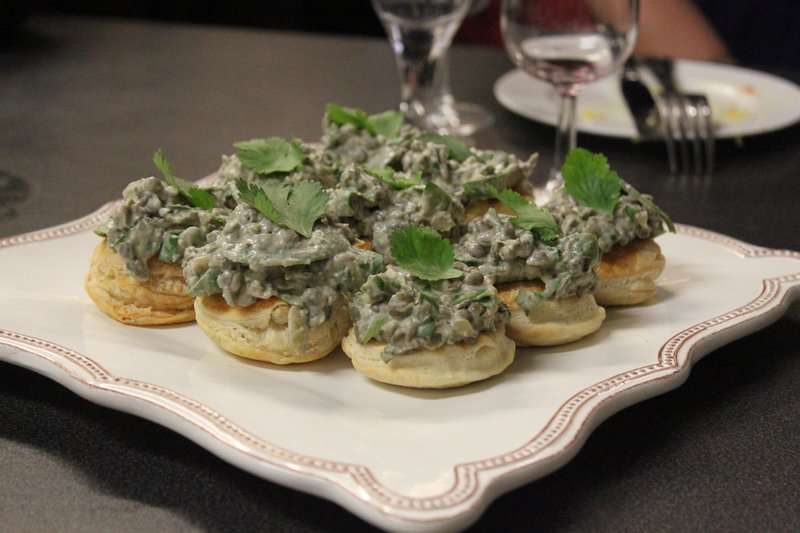 Florent Garaudet served with mackerel tartar on an olive crouton with crispy skins. 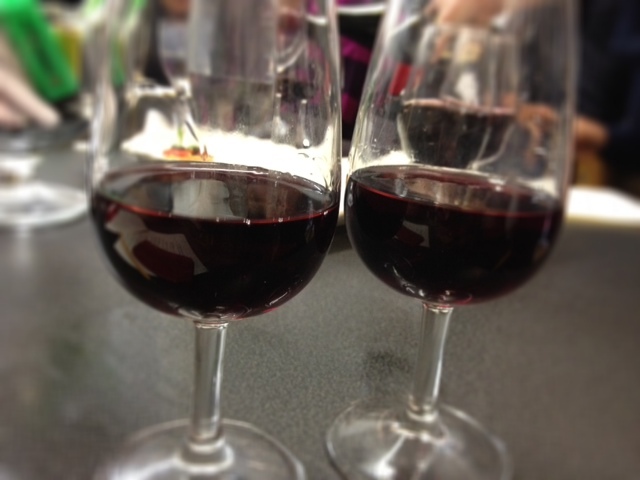 We then tried two Pinot Noir side by side; 2012 Santeney “Clos de Hates”, Dom. Bachey-Legros and 2009 Bourgogne Grance Ordinaire, Dom. Guy Castagnier. The former was lighter and the latter, which I preferred, tasted more of berries. 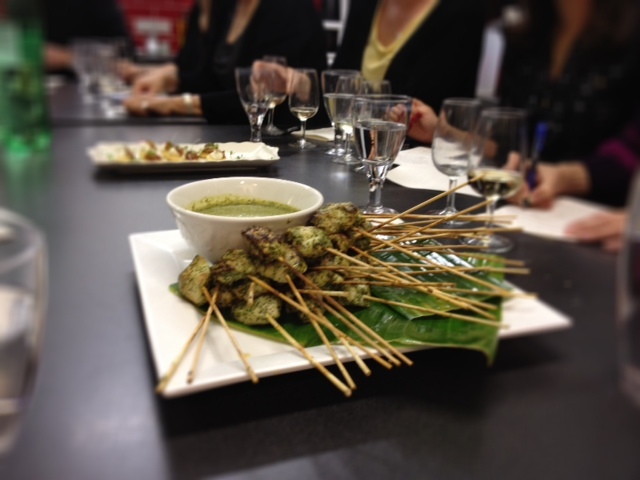 We tried them with honey soy glazed salmon scewers and thai chicken scewers with a coconut and green chilli dip. We then got to try a wine from the Rhone Valley; 2008 Star Terre Grenache, Oroncio served with crispy duck pancakes in hoisin sauce with cucumber and spring onion. Both divine! The last two canapés were sweet, put we didn’t try a single pudding wine. 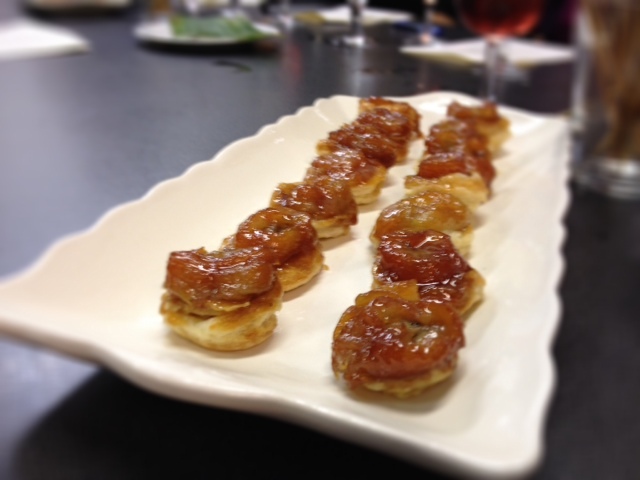 Instead we had a fruity rosé (2010 Bourgogne “Rose”, GAEC Felettig) with the caramelized banana tarte tatin, which was, although I am not that fond of bananas, delicious. 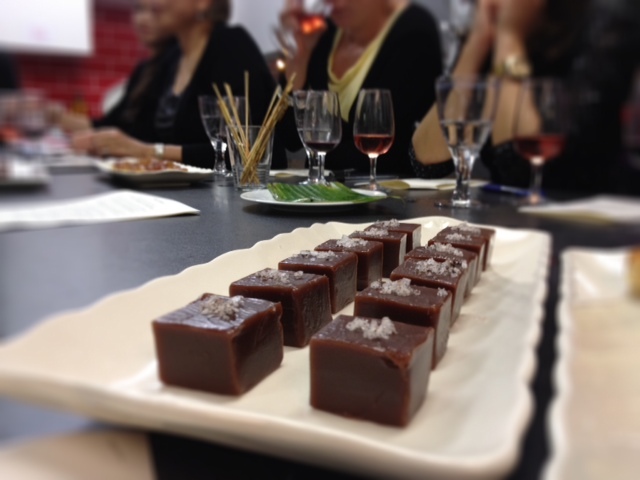 The last sweet, amazing chocolate fudge caramels with vanilla salt, was served with a really nice port ( 27 Grapes, Quinta do Portal). I like the idea of port and chocolate and will definitely try this at home. I had such a lovely evening and would love to do this again. Both the food and the wines were excellent and I really enjoyed trying the wines with the matching food, so I know how to think when pairing food and wine at home. Footnote: I was not invited as a blogger to this event, nor asked to blog about it. It is not often I feel confident recommending wines, but at least I know what I like. 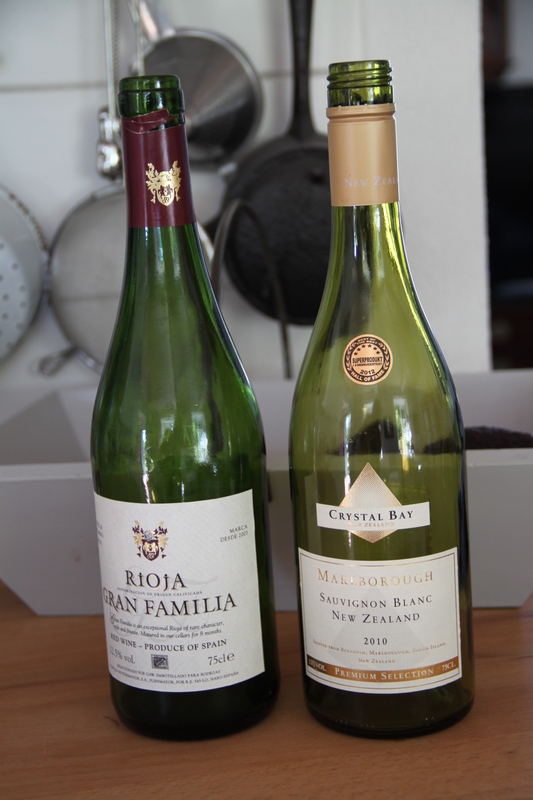 And when I, for my birthday party, managed to pick wines that everyone raved about I just feel I should spread the word. The white; a Sauvignon Bland from Marlborough, New Zeeland, was a fresh-tasting wine with hints of elderflower. It felt very summery and goes well with seafood. The red; a Rioja that was very easy to drink; neither heavy nor light worked well with meats or to drink on its own. 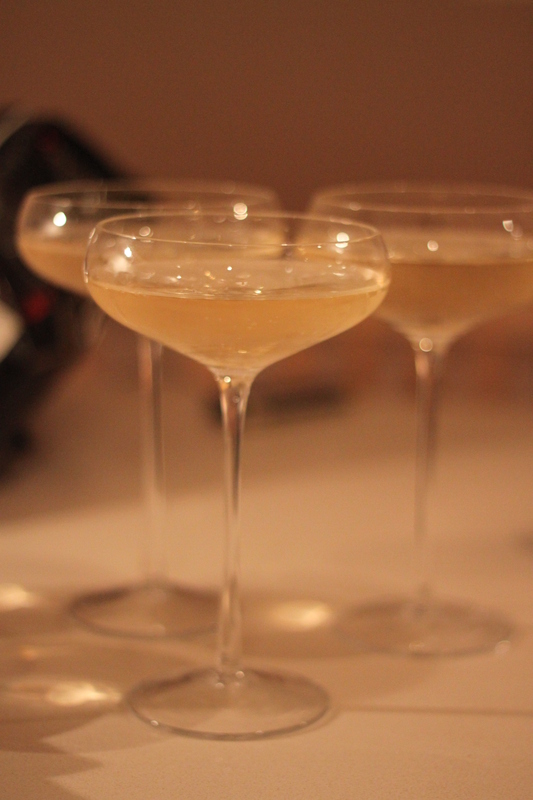 We also had some bubbly before dinner, that I can recommend if you want something nice but not pricey. During Easter I managed to meet up with one of my dearest childhood friends, Karl. He lives abroad too and it is not often that we are both at home in Sweden at the same time. Karl works in Norway as a restaurant manager and sommelier so when we met up we obviously talked about food. He also gave me a very nice gift; sweet sherry from the year we were both born. It has been aged for so long that it has become syrupy and a bit too sweet just to drink. Instead Karl recommended it be poured over vanilla icecream as dessert. I obviously tried this more or less straight away and it was seriously yummy. The dessert is of course very simple to make, but is still worthy to be a dinner party finale. 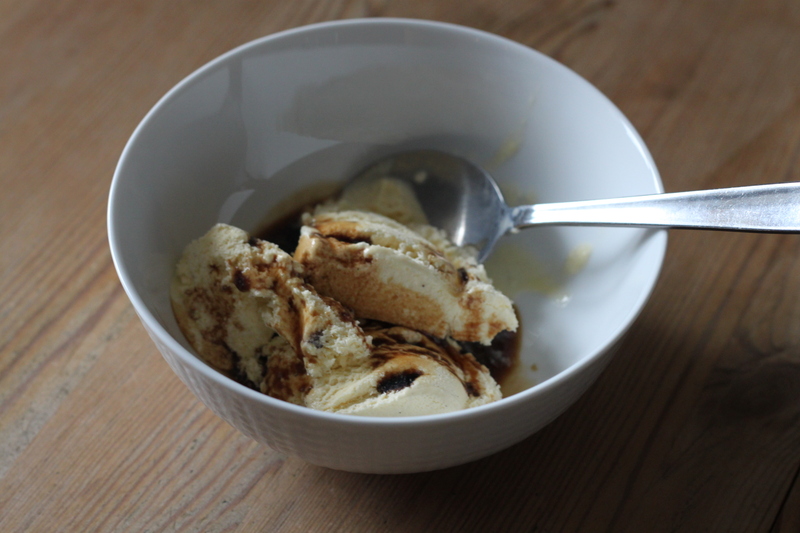 And with homemade vanilla icecream this would be even nicer (we used bought icecream this time). Do try this at home, folks! If you ever get the post dinner low bloodsugar and fancy something sweet but don’t have any dessert at hand, then just open a bottle and pour some of its content into a glass with ice. Amarula on the rocks, is even better than Bailey’s on the rocks, and just hits the spot. Amarula cream is a creamy (duh) liqueur made from the Marula berries that grows on trees in South Africa. A colleague who grew up there told me that when the fruit ripens it produces alcohol and when it falls down the tree the animals eat it and get all drunk. If you don’t believe me (her) check this video out! I like to be challenged in the kitchen, and that is why I thought it was a good idea to cook for my friend Jenny and her boyfriend James on NYE before heading to a party. Last time I invited James I cooked a whole lot of mezze dishes inspired from my trip to Syria and Ottolenghi’s book Plenty. 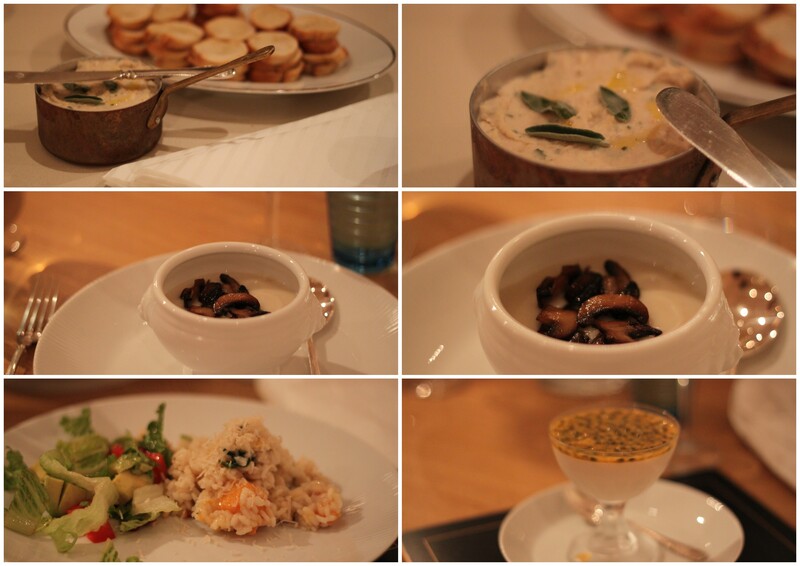 I wanted the NYE menu to be quite traditional, nice and vegan and because it was just for the three of us I kept it quite simple. 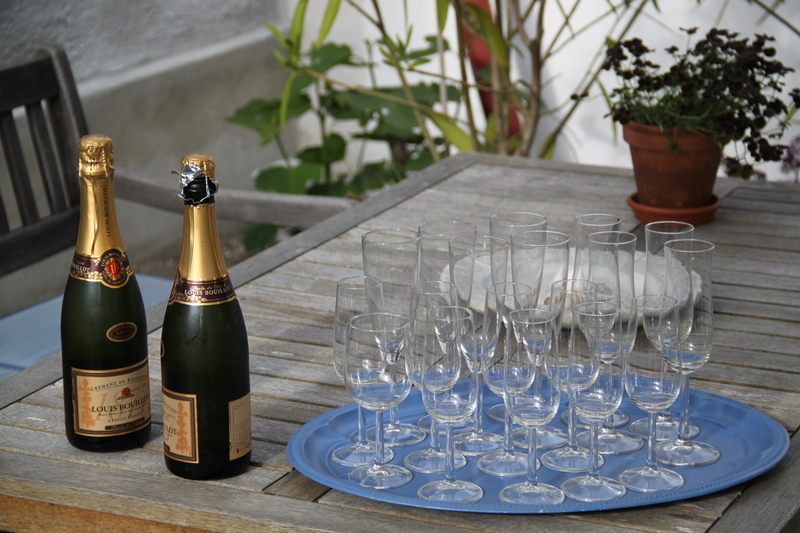 We had champagne to start as well, and thanks to Waitrose I got a great bottle of bubbly half price. 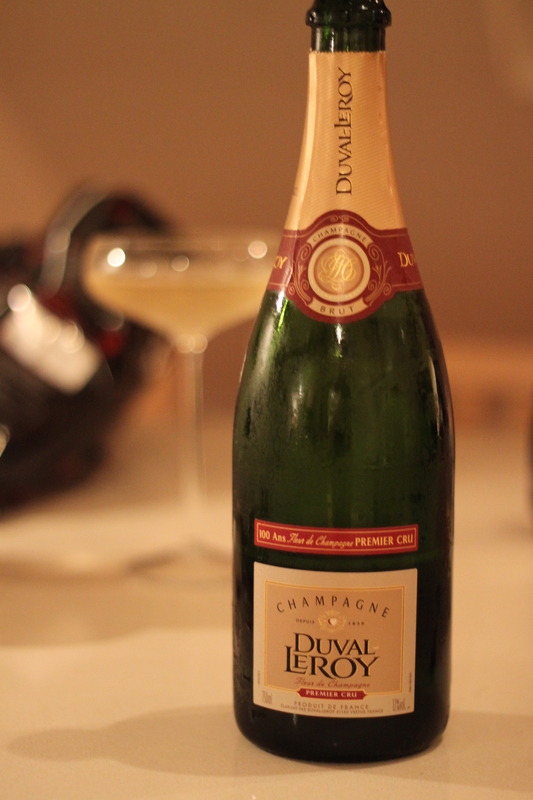 At the champagne tasting at Harrod’s I tried some champagnes from Duval-Leroy, but not thiis one; their regular Brut NV, but because I liked the others and it is a good quality champagne house I bought this bottle and it was really good. Fry the onion until soft in the oil. Add the artichokes to the pan and fry for a minute or so, Add hot water to cover and add salt. Bring to the boil and cook until very soft. Remove half the water, but keep it on the side, and puré the rest with the artichokes. Add the coconut milk and then adjust the thickness with the left over water. Add concentrated stock, salt and pepper. Bring to the boil again and serve. Peel the squash and remove the seeds. Cut it into chunks and place them in a roasting tray, add oil, salt and pepper and mix. Place in 200C for 35 minutes or until soft. Fry the onions in olive oil in a casserole dish or large saucepan but don’t let it brown. Add the rice and stir for a minute or two. Add the wine and watch most of it evaporate. Then add a ladle of the hot stock and continue to stir while it cooks in. Add another ladle and repeat the procedure until all the stock is used up and the rice is soft. it usually takes 18-20 minutes depending on the type of rice. Add the spinach and stir until it is wilted. Season with salt and pepper and add the butternut squash. Feel free to serve with parmesan if you’re not vegan. I tried my way through when I cooked this, to get rid of the particular aftertaste soy products have, and I recommend you do the same. Add the cream to a sauce pan and the smaller amount of sugar and vanilla and heat it up. Then add the sugar and vanilla little by little until you are satisfied with the taste. Add the jeling agent if not using jelly sugar. Bring to the boil and stir so the sugar melts. Pour into dessert coupes or ramekins and leave to cool. Place in the fridge for a minimum of four hours to set. 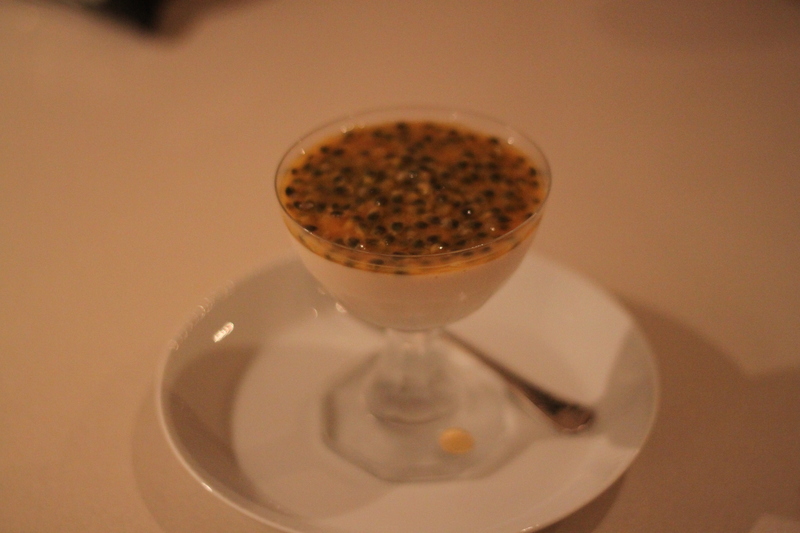 Before serving, place the inside of the passionfruits in a bowl and place enough on each pannacotta to cover the top. Serve and enjoy.